Jumping into the Skyzone – The Small Things. What did you do with your Saturday night? 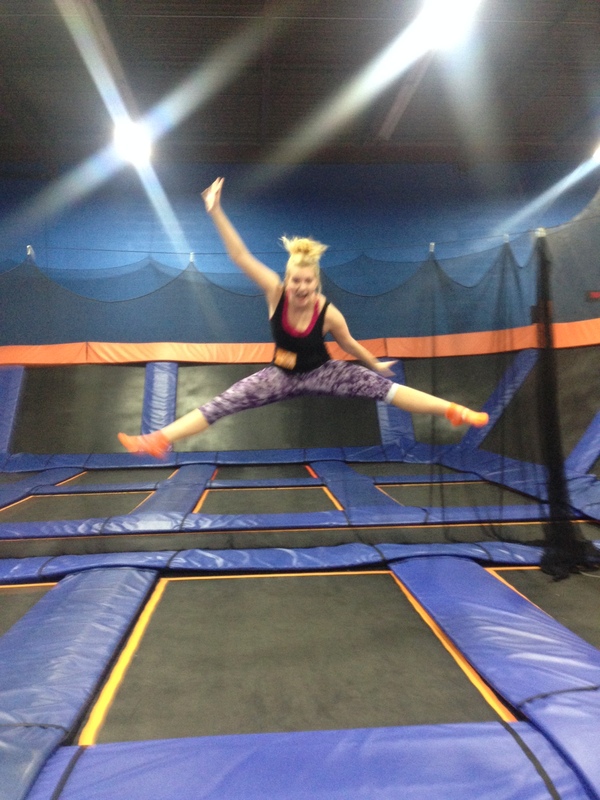 I spent mine at Skyzone, a massive indoor trampoline park! Basically it is a room just filled with trampolines. Trampoline basketball, trampoline dodge ball, trampoline foam pits. This place has it all. Fun Fact! 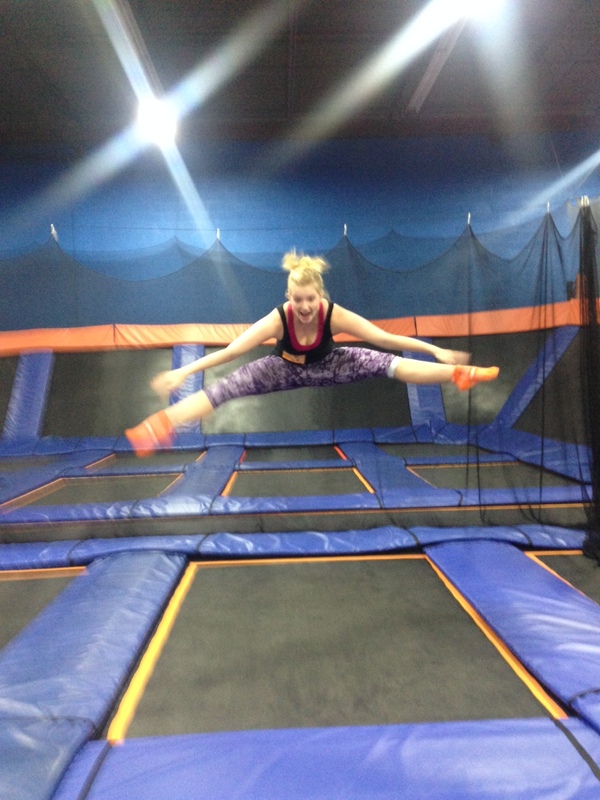 Trampolining for 1 hour can burn up to a thousand calories! For 20 bucks I got a pair of special orange trampoline socks, a slice of pizza, a can of pop and an hour and a half of jumping freedom. I had such a fun time because it was a really unique way for my friends and I to enjoy a Saturday night out! 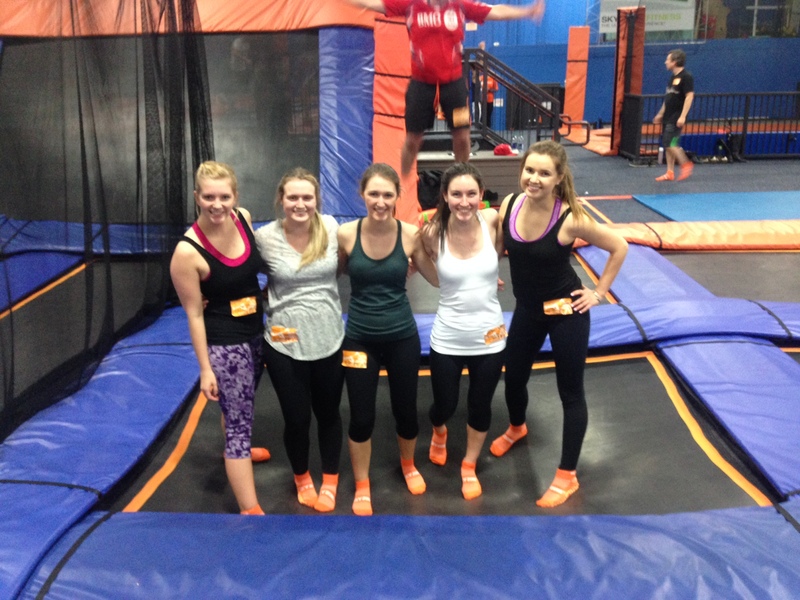 Normally a night out looks like late nights and empty calories but not at Skyzone! When your night out is at a trampoline park it means fitness and fun! The weekend fitness didn’t stop there, either! On Sunday morning I woke up and went to a fantastic hot yoga class! The moves were all pretty basic but my body was sore from all the jumping and yoga provided just the stretch I needed. Then when I got home I was compelled to clean my apartment top to bottom. I have no idea what came over me this weekend. I was productive on Saturday with laundry, baking and vacuuming but I took it to the next level on Sunday. I gave my whole bathroom a much needed scrub down. My arms were aching afterwards but the streak free glass around my shower makes it so worth it, also biceps! Have you ever visited a trampoline park? What non-traditional activities do you do to get fit? Share in the comments! ← Saturday Morning Protein Balls! I’ve always wanted to try this place out. Looks like you had a blast!! Do you blog about these types of places often? Thanks for the share! Maybe I’ll check it out! Hi Sharon, Thank you for taking the time to read! My blog is just about the things I get up to on a day-to-day basis. When I go to cool places or do interesting things I blog about them. Sometimes it is related to fitness, sometimes travel abroad, sometimes it is just a space for me to get my thoughts out of my head. Anyway, I recommend getting a group of friends together and going to Skyzone. It isn’t too expensive and it is a ton of fun! Be sure to get there early so that you get a spot. Jumping starts at 9 pm but I got there with my friends at 8:30! If you go be sure to let me know! I shall let you know! Must try this place!! Looks like so much fun! Do it! You will have such a fun time! It is a cheap, fun, unique Saturday night! Just be sure to get there early as spots are limited! Have fun & thanks for reading! I use 7 minute trainer and yoga studio applications. Gives me the freedom to be the introvert writer I wish I was…. I haven’t heard of those! Are they for iPhone? I’m always looking for structured at-home type programs. When I’m left to my own imagination I get lazy. Which is why I go to places like this and to the gym. I find guidance always takes workouts to the next level. I’m pretty sure yoga studio is for iPhone only. There are a ton of 7 minute trainers out there that all do the same types of different activities. Any one will be as effective as the next. I like mine because it tracks my calories on the new health app on my iPhone.